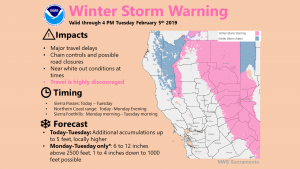 February 3, 2019 – Series of Pacific storms will impact Northern California through Tuesday. Periods of moderate to heavy precipitation with gusty wind and isolated thunderstorms are expected. Drier weather returns by midweek. Upper low weakening to trough as it tracks across Central CA this morning. Widespread showers overnight producing mostly light to moderate precipitation. System has increased wind from around the Sacramento area southward as it moved onshore. Guidance suggesting strongest wind is occurring now and speeds will trend down through the morning hours. Showers will continue this morning, becoming more widespread again this afternoon as instability increases and next short wave trough moves inland. Best CAPE, to around 300 J/kg, depicted from about the Central Sac Valley southward this afternoon for potential isolated thunderstorm development. Snow levels progged to be around 4000 to 5000 feet today. Another short wave trough follows inland tonight into early Monday bringing additional showers and colder air into interior NorCal. Snow levels overnight lower to around 3000 to 4000 feet. 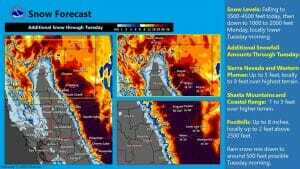 Wave followed quickly by a colder and much deeper system digging south from B.C. along the West Coast. This will result in additional precipitation with heavy snow in the mountains. 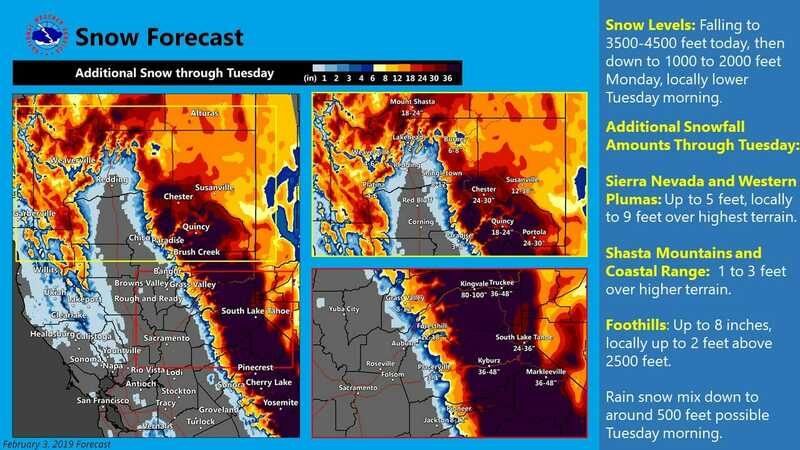 Snow ratios increase to 15 to 1 or more as snow levels lower into the foothills Monday. 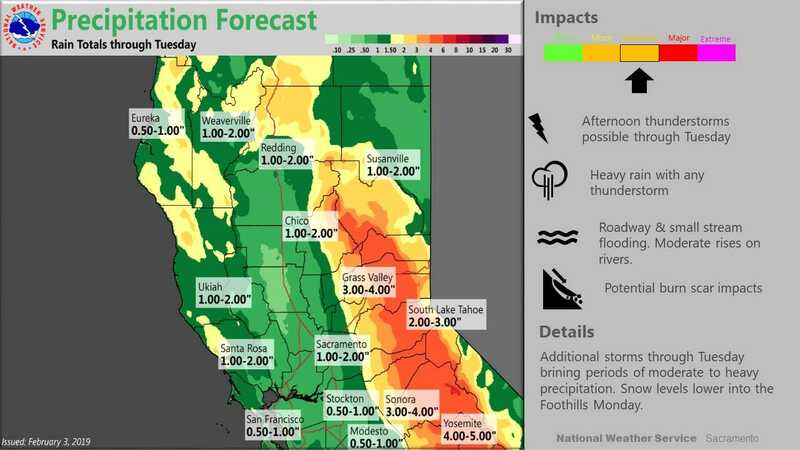 Significant snow possible in the foothills with additional 5 feet or more possible in the Sierra Nevada. Steepening lapse rates Monday could lead to thunderstorm development in the Central Valley. With 5h temps lowering into the lower -30s Deg C, stronger storms likely to produce some hail. Upper low and associated cold pool tracks inland over NorCal early Tuesday, then into the Great Basin in the afternoon. -6 Deg C at 850 Tuesday morning supports some rain/snow mix, if showers occur, in the Northern Sac Valley to around the 500 ft elevation. Showers become more widely scattered during the day Tuesday as main dynamics shift east of the CWA. High temps Tuesday expected to be upwards of 10 to 20 degrees below normal with upper 40s to around 50 in the Central Valley and 20s to low 40s for the mountains and foothills. Showers end by Tuesday night as subsidence increases and drier northerly flow aloft sets up over interior NorCal. Upper ridging begins to build back inland on Wednesday with continued below normal temperatures. 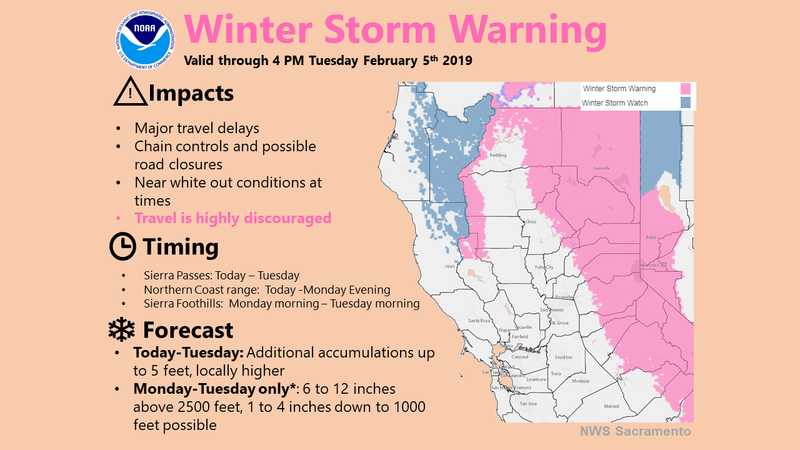 Dry and cool weather forecast to continue Thursday, then another cold weather system is expected to drop down from the north bringing showers to the region next weekend with more snow down to the foothill elevations.